Pleased with our outstanding exhibit “Your Water, Your Life!,” Wilderness Graphics was called upon, once again, to enhance the displays at this wonderful hands-on, community nature center in Largo, Florida. What better way to learn about the natural world around you than under the shady boughs of an ancient oak! Wilderness Graphics fabricated and installed a dramatic full-size, life-like replica tree to stand sentinel over the exhibit space. The huge trunk, complete with mottled bark and spreading roots, rises to the ceiling, where leafy boughs extend out across the room. An adjacent trunk slice teaches of dendrochronology – the study of tree growth rings. 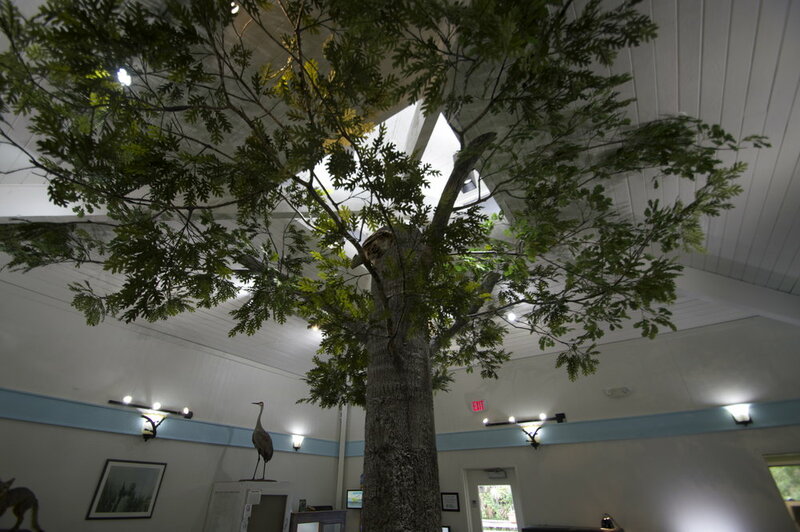 Our team went above and beyond the client’s expectations, installing taxidermy birds within the canopy to peek down on visitors from above. We also upgraded the room’s lighting with energy-efficient LED bulbs. “Sunshine” now filters through the branches, creating dappled patterns on the floor and adding to the outdoor ambiance of the space. Visit the nature center soon to experience the full effect of our latest addition!